I have a great crop of eggplant this year so I’ve been looking for ways to use them. 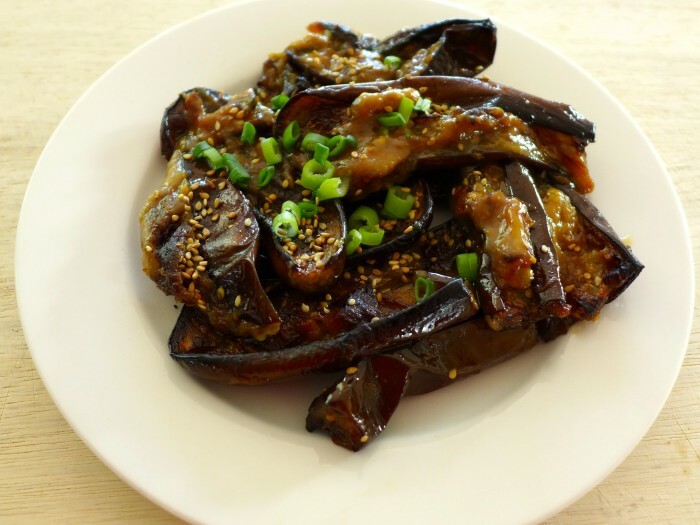 A month or so ago I saw Adam Liaw on SBS, cooking Nasu Dengaku, that wonderful Japanese dish of grilled eggplant with miso, and I mentally filed it away to use when the eggplant ripened. When I went searching this week for the recipe, I came across this simpler one, which is less work. I’ve dropped the amount of oil in it as well. While it is not as fancy and good looking as the genuine one, it does taste great. Fresh from the success, I decided to have a go at the same dish using zucchini, because I have SO MANY. This is a good way to use up the larger ones that have gotten away. The zucchini were not as delicious as the silky eggplant, but still pretty good. I think this would work well with many vegetables. Preheat the oven to 200 C fan forced or 210 if you don't have a fan forced oven. Toss the eggplant or zucchini in the oil and put in a single layer in a baking dish. Roast for 20 minutes or until soft and lightly golden. Mix all the remaining ingredients until smooth. Pour over the vegetables and return to the oven for another 10 minutes for the sauce to caramelise. Garnish with some finely chopped spring onion and toasted sesame seeds. oh yum, I love roast eggplant! This looks wonderful! I’m a big fan of nasu dengaku (and all other Japanese vegan food :)) so will definitely give this a go. I love nasu dengaku and would never have thought of applying this method to zucchini – great idea. Well, when one is buried under an avalanche of zuchhini… 🙂 Though I have to say, the eggplant is better. It is a textural thing. Nothing beats the silkiness of well cooked eggplant. Ooh, I love these flavours! Yes they are good flavours!